Here is the new poster from Magnolia Pictures’ upcoming film “SHADOW DANCER”. 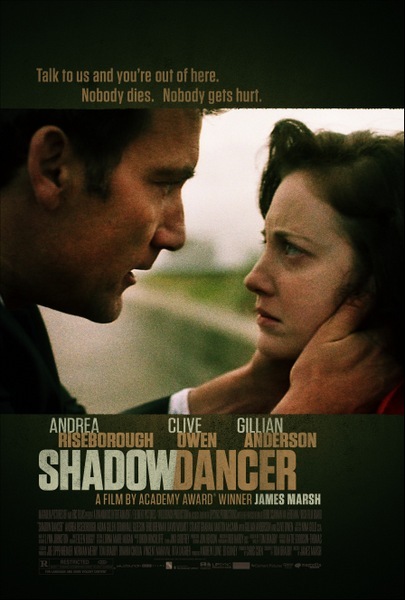 The film is directed by James Marsh, starring Andrea Riseborough, Aidan Gillen, Domhall Gleeson, Brid Breenan, David Wilmot, Martin McCann with Gillian Anderson and Clive Owen. A conspiracy thriller set around an act of betrayal within a tight knit family, the story centers around single mother Collette McVeigh (Riseborough) — a Republican living in Belfast with her mother and hardliner IRA brothers. When she is arrested for her part in an aborted IRA bomb plot in London, an MI5 officer (Owen) offers her a choice: lose everything and go to prison or return to Belfast to spy on her own family. With her son’s life in her hands, Collette chooses to place her trust in the MI5 and return home. When her brothers’ secret operation is ambushed, suspicions of an informant are raised and Collette finds both herself and her family in grave danger. With informants working on both sides, Collette’s psychological and personal turmoil builds.